Quickly forging a reputation as one of the best city cars out there the Toyota Aygo excels in all areas including looks, performance, value for money and economy. Now in its 2nd generation the Aygo continues to dominate the small car market. You have a choice of 2 or 4 door versions thanks to clever engineering. Available in 5 trim levels and with customisation options that will excite the Aygo is everything a city car should be with tight cornering and go kart like grip. Extremely cheap to run with fuel economy around the 68.9mpg mark. No road tax is required thanks to the low emissions. The standard 5 year Toyota warranty is a welcome bonus. The manual 1 litre gearbox is the fastest with 0-62mph taking 14.2 seconds. The interior sports a glass black finish with easy to use controls. USB ports are standard as is hill-assist and LED daytime lights. The trim that features the rather smart 7-inch touchscreen are our favourite these are form the X-Play level upwards. Round the back boot space is set at 168 litres, big enough for a couple of suitcases or soft luggage bags. 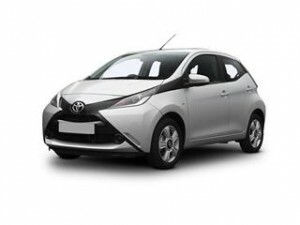 See how much you could save on the iconic Toyota Aygo with the fully trained staff at Coast2Coast Cars. You might be surprised to find you could save thousands from list price of your new car just by using our professional deal hunters. Just spec the car of your choice and we do the rest, displaying deals and offers to suit your budget and with no obligation at any point it’s easy why we should be first on your list when you’re looking for a new car. Finance can be arranged too via the dealer direct subject to status simply ask for more details when you have received your new car quotes.